Deepak RAO Edu-tains at IIT Techfest 2001 - Mumbai. On 19th Jan., for the 2nd time, Deepak Rao presented his ‘ESP’ Show scheduled at 6 pm. a Full House 15 min. before time. Ask any student who attended TF2001 - Mumbai, to name the only thing he recollects about the fest. 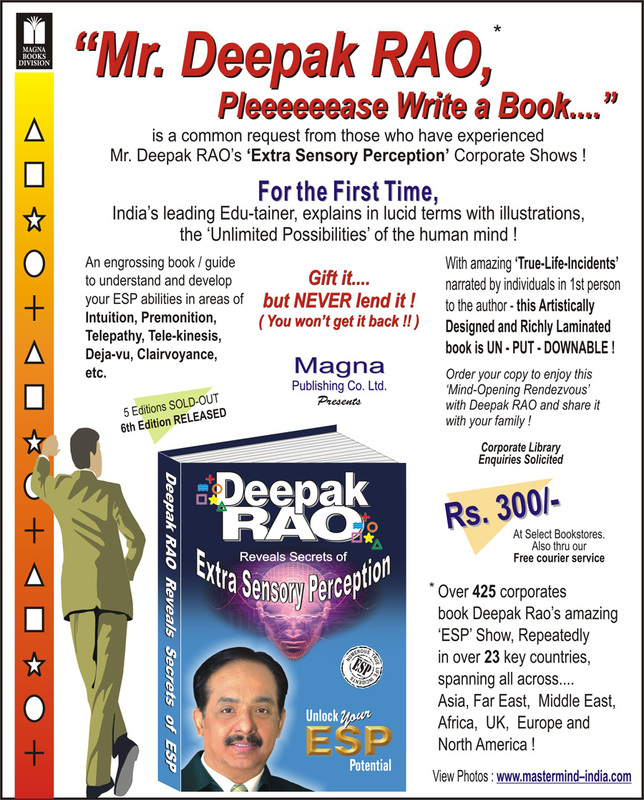 Chances are, you are going to hear about the Uri Geller of India, Deepak RAO. On 19th Jan., for the 2nd time, Deepak RAO presented his ‘ESP’ Show scheduled at 6 pm. to Techfest 2001. One of the very rare events at IIT that saw a Full House 15 min. before time. Sharp 6 pm. the show starts. The Lecture Theatre is packed to full capacity and more people are waiting outside to come inside. Deepak RAO, India’s answer to Uri Geller, comes on stage. Looming large and pulling the crowds with his remarkable ability to hold the audiences spellbound. Deepak Rao can Read Minds ! What he did on stage amply demonstrated the fact. Rao conducted presentations on.... Lie Detection, Extra Sensory Perception, Levitation, Intuition, etc. The audience was so excited that they kept rushing to the stage to participate. So zapped, was the student groups that traditional bowing took place. Rao was mobbed for autographs and photographs alike.